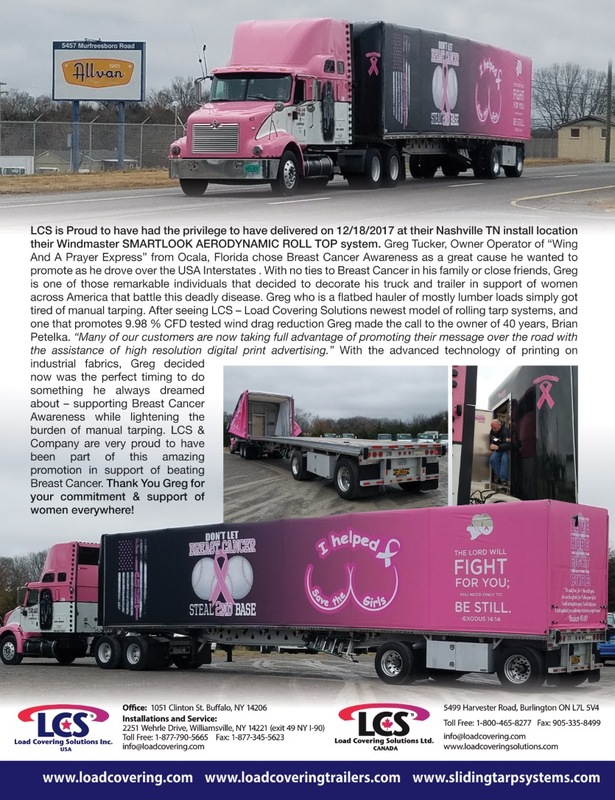 LCS-USA's engineered lightweight & heavy-duty panels provide versatility for all your side kit needs. You know LCS-USA as North America's leading manufacturer of side kits. Now, LCS-USA has brought the evolution of the side kit from heavy duty to lightweight yet durable construction. (3) Models of Tuff-Lite panels, Tuff-Lite, Tuff-Lite I, and Tuff-Lite II. Tuff-Lite panels weigh between 12 to 15 lbs. Respectively reducing the original weight of a side kit from 1,200 lbs. Down to approx. 700 lbs. Tuff-Lite - Consists of a fluted plastic core surrounded by a rigid aluminum panel guard. Tuff-Lite I - High gloss, pebble textured fiberglass skin is laminated one side, over a fluted plastic core and is surrounded by rigid aluminum panel guards. Tuff-Lite II - High Gloss pebble textured fiberglass skin is laminated both sides, over a fluted plastic core and is surrounded by two options of panel guards. 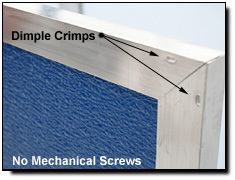 Option 1: Pressed on Aluminum Guards with dimple crimps in the corners both sides to ensure the pane stands up to day to day handling. Option 2: New Release Plastic Guards. This panel was developed by our company over 10 years ago and we have been sitting watching our fleet customer�s running with dozens of trailers eliminating their aluminum guard problems. 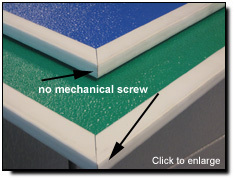 Most commonly plastic panels with aluminum guards never stay on long term. Fleets are forever replacing them making maintenance a nightmare. 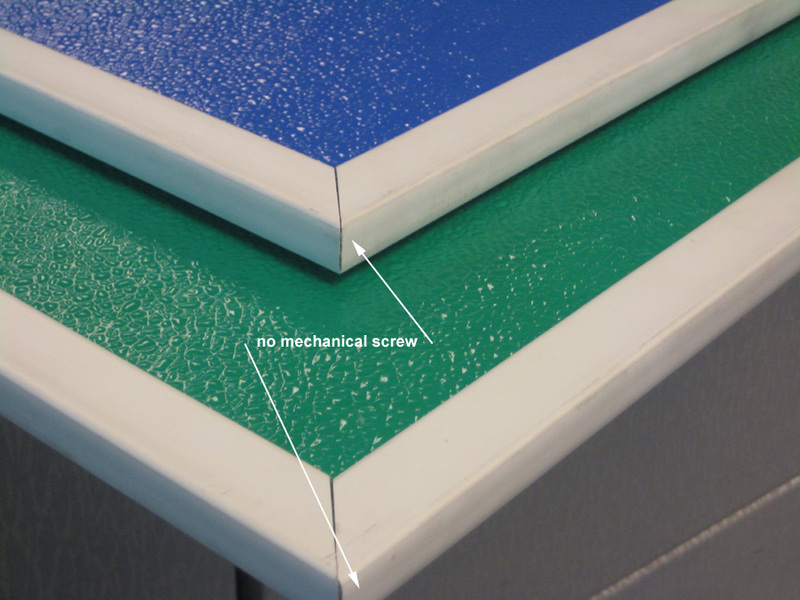 With the new high impact plastic panel guard you need to start with a two sided fiberglass fluted panel. With our captive adhesive applied to the interior of the guard, the panel is pressed into the guard and with a 24 hour cure time, these panels are proving to outlast anything else on the market. 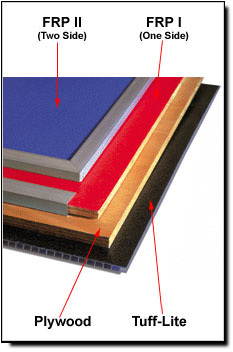 (2) Models of attractive, low-maintenance fiberglass reinforced plywood (FRP) panels (fiberglass on one or both sides). Aluminum panel guards on the top and bottom. FRP I - High gloss pebble textured fiberglass skin is laminated one side, over a 1/2 fir plywood with rugged self locking aluminum panel guards along the top and bottom edges. All edges and interior face are sealed and painted with one coat. FRP II - High gloss pebble textured fiberglass skin laminated both sides, over '/2"fir plywood with rugged self locking aluminum panel guards along top and bottom edges. All edges are sealed and painted with one coat. 1/2" exterior-grade Douglas Fir with sealed and primed edges to keep moisture out. Aluminum panel guards the top and bottom. Good one side construction, sealed and painted both sides and edges. Both plywood panels come standard rugged panel guards along bottom edge.